As we wrap up Q2 of 2018, Michael Lebowitz and I present our “chartbook” of the “most important charts” from the last quarter for you to review. In addition to the graphs, we provided a short excerpt from the article as well as the links to the original articles for further clarification and context if needed. We hope you find them useful, insightful, and importantly we hope they give you a taste of our unique brand of analysis. In most cases, the graphs, data, and commentary we provide are different from that of the business media and Wall Street. Simply put, our analysis provides investors an edge that few are privy to. 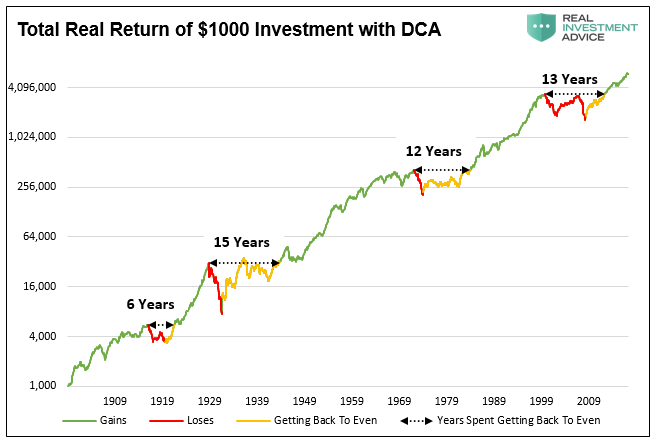 “The chart below shows the S&P 500 as compared to annualized returns and the average of market returns since 1900. Over the last 118 years, the market has NEVER produced a 6% every single year even though the average has been 6.87%. “Yes, margin debt does increase as asset prices rise. However, just as the ‘leverage’ provides the liquidity to push asset prices higher, the reverse is also true. The second problem, which will be greatly impacted by the leverage issue, is liquidity of ETF’s themselves. “To Ben’s point, what happens to many investors is they get ‘whipsawed’ by short-term volatility. While the signal gets them out, they ‘fail’ to buy back when the signal reverses. The answers are ‘yes’ and ‘it doesn’t matter.’ That is the just part of the investment strategy. “Rising interest rates are a “tax.” When combined with a stronger dollar, which negatively impacts exporters (exports make up roughly 40% of total corporate profits), the catalysts are in place for a problem to emerge. 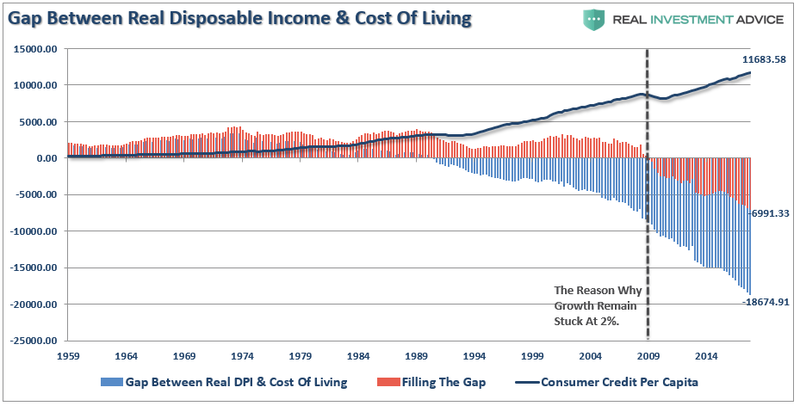 With a deficit between the current standard of living and what incomes, savings and debt increases can support, expectations of sustained rates of stronger economic growth, beyond population growth, becomes problematic. For investors, that poses huge risks in the market. “Why are so many people struggling to find a job and terminating their search if, as we are repeatedly told, the labor market is so healthy? To explain the juxtaposition of the low jobless claims number and unemployment rate with the low participation rate and weak wage growth, a calculation of the participation rate adjusted unemployment rate is revealing. “Given real-world return assumptions, pension funds SHOULD lower their return estimates to roughly 3-4% in order to potentially meet future obligations and maintain some solvency. “The feedback from Josh, Dan and others expose several very important fallacies about the way many professional money managers view investing. These are some of our favorite charts and we hope you find them useful and insightful. Please send us any comments, suggestions, or your favorite charts to us for consideration. “Rising Rates Will Kill The Stock Market Rally!” – Is That True? Model, Model on the Wall; Which is the Fairest of Them All?